If you are not familiar with the legend of Spartacus then here is a quick briefing. Spartacus was a Thracian gladiator who is believed to have lived between 111 BC and 71 BC. He was one of the escaped slave leaders of the Third Servile War which was a huge slave uprising against the Roman Empire. You might have heard the phrase “I am Spartacus!” that refers to the 1960 movie called Spartacus starring Kirk Douglas. The movie has a scene where the Roman soldiers are searching for Spartacus and he reveals himself only for his fellow slaves to then also claim they are him so that the soldiers have no idea who the real Spartacus is in an act of solidarity. The developers at WMS Gaming decided that Spartacus would make for a great icon for a mobile slot and here we find ourselves playing and reviewing this 5x4 and 5x12 reels, 100 payline title that comes with Colossal Reels. The Colossal Reels feature consists of there being a small set of 5x4 reels and then a larger set of 5x12 reels. 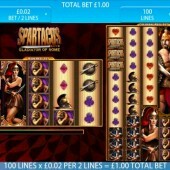 This has been present in other WMS Gaming slots but Spartacus is the first to bring it to the mobile platform. This layout creates more opportunities to win big. Symbols on the reels relate to things that can be linked to the Roman era of rule. These include swords, shields, helmets, lions, gladiators, and the love interest of Spartacus. The regular 9-through-to-Ace symbols that can often appear are replaced by sets of symbols from suits in a pack of cards including spades, clubs, diamonds, and hearts. I Am a Stacked Wild Spartacus! The Spartacus logo acts as the Stacked Wilds on this mobile slot. It substitutes for all other symbols, except the Coliseum Scatters, to help you complete any potential winning combinations that might appear across the two sets of reels. There is a free spins bonus round available to trigger on the game too. You will need to hit three or more Coliseum Scatters across both sets of reels to trigger the free spins. If you hit three Scatters you will win 8 free spins with a 2x multiplier. If you hit four Scatters then you will earn 12 free spins with a 5x multiplier. If you hit five or more Scatters on the reels then you will receive 20 free spins with a 20x multiplier. The Scatters only appear on reels 1, 3, and 5 on the 5x4 set of reels and on reels 1, 3, and 5 on the 5x12 set of reels. Spartacus – Gladiator of Rome is a top mobile slot. The possibility of hitting 20 free spins with the 20x multiplier is a real incentive on this game. The inclusion of Stacked Wilds is also pretty immense. I hit quite a few decent-sized wins playing this and I also found that even when I wasn't winning big I was still getting a kick out of playing this mobile slot because there's so much going on with the Colossal Reels. It definitely outclasses other multi-reels mobile slots from WMS such as the martial arts-themed Bruce Lee and the underrated Fire Queen, which is no mean feat.